1973 saw Tsairis et al. report on case studies within a family where myoclonus epilepsy was associated with ragged-red fibres (RRFs) from muscle tissue biopsies in addition to abnormal blood lactate and pyruvate levels(1). In 1980 Fukuhara N. et al. publish a case study(2) of 2 patients who presented in much the same way as described by Tsairis et al. 7 years ago. Fukuhara et al. entitled their study “Myoclonus Epilepsy associated with ragged-red fibres (mitochondrial abnormalities): Disease Entity or a Syndrome?” and in so doing, introduced a question highlighting difficulties that the classical ‘single disease’ medical model encounters when trying to account for overlapping constellations of symptoms. In November of the same year, Wallace et al. come to identify this particular constellation of symptoms by the acronym ‘MERRF’ following “pathophysiological and biochemical characterization of a mitochondrial DNA disease” as their study title reports(3). ‘Fukuhara’s Disease’ is another name for it. Soon thereafter in 1981, the human mitochondrial genomes’ sequence & organization is published in Nature(4), laying much of the ground work for answering the how’s & why’s behind Fukuhara et al.’s question. The molecular clue for MERRF was elucidated in 1990 by Shoffner, Wallace et al. 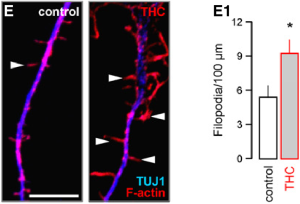 who identified a mitochondrial tRNALys (mt-tRNALys) point mutation responsible for much of the epilepsy, defective mitochondrial energy production and age-related genotype-phenotype associations observed in MERRF patients(5). The molecular mechanism boils down to defective oxidative phosphorylation (OXPHOS) in the mitochondrial electron transport chain (mETC), caused by faulty protein synthesis originating from a point mutation in the MTTK gene erroneously encoding the highly conserved TѰC loop of its mt-tRNALys gene product. This results in aberrant taurine modification, also known as a “wobble modification defect [which] is primarily responsible for dispossessing the mutant tRNALys of its cognate codon binding affinity, forcing the mutant tRNALysUUU to become translationally inactive”(6). Nowadays, disorders characterized by defective oxidative phosphorylation are termed ‘mitochondrial disorders’(7). Shoffner & Wallace called the tRNALys point mutation in the (modifiable) highly conserved TѰC loop producing a CviJI restriction site “a simple molecular diagnostic test for the disease”(8). See a depiction of this in Figure 3A below, from Shoffner & Wallace’s seminal paper on MERRF. Nowadays however, it is known that the mt-tRNALys point mutation exchanging an A base for a G base at nucleotide position 8344 in the mt-tRNA gene MTTK(9) is not solely responsible for all MERRF (and MERRF-like) conditions but is present in ≥80% of patients(1). Other mutations in mitochondrial genes, including but not limited to: m.8356T>C, m.8361G>A and m.8363G>A account for another 10% and m.611G>A and m.15967G>A for the other 5%(11). This expanded range of mutations in addition to rare MERRF case studies presenting unique mutations (e.g. Mancuso et al. 2004(12)) speaks to the pleiotropic nature of mitochondrial diseases generally, in terms of origins & clinical phenotypes. Furthermore, the etiology of many diseases traditionally regarded as solidly Mendelian within the 1-gene-1-enzyme(13) paradigm is strongly challenged considering that a given clinical phenotype may originate from a staggering diversity of genotypes. A powerful visual depiction of this is seen in Figure 3 from DiMauro et Schon’s 2003 paper(14) which maps “Mutations in the Human Mitochondrial Genome That Are Known to Cause Disease”. There are examples of multivariate influences affecting phenotypes of even classical Mendelian disease like cystic fibrosis. Although 70% of cystic fibrosis patients inherit a mutated CFTR gene (del508) in an autosomal recessive Mendelian manner, in 2005 it was found that in a cohort of 69 Italians carrying this mutation “those who also carried the R131 allele of the immunoglobulin Fc-gamma receptor II gene had a 4-fold increased risk of acquiring chronic Pseudomonas aeruginosa infection (p = 0.042) [which] suggested that FCGR2A locus variability contributes to this infection susceptibility in CF patients”(15). This suggests that nowadays, Mendelian labels are better used for qualifying inheritance patterns than meaningfully categorizing diseases. MERRF reflects classical mitochondrial inheritance patterns where only an affected or unaffected mother can transmit the condition to her offspring. Fathers cannot transmit mitochondria to their children because sperm do not contribute mitochondria to the zygote which will, however, contain the mitochondria from the mother’s ovum. Interestingly, a few isolated cases of paternal mitochondrial inheritance have been observed but not replicated in such a way as to challenge the standard model of inheritance just mentioned”(16,17,18). Barring a handful of exceptions, every human cell contains hundreds of mitochondrial organelles, each carrying about 2-10 little (~16.5kb) double-stranded closed-circles of mitochondrial DNA (mtDNA) that make up our mitochondrial genomes. We have inherited this genome from our most recent common female ancestor about 180,000(19) years ago (commonly referred to as ‘Mitochondrial Eve’). These polyploid mitochondria are normally mostly homoplasmic (identical or of the same kind). However, they do intrinsically mutate stochastically at higher rates than observed in our nuclear genome. Per this tendency, they become transiently heteroplasmic during cellular division (mitosis) and are then distributed into daughters cells – also in a random manner. Here heteroplasmy simply refers to the mixture of mutated and non-mutated (or mutated and wild-type) mtDNA molecules within a cell. MERRF is heteroplasmic condition. Affected patients demonstrate a ‘threshold’ effect, wherein the proportion of mutant mtDNA molecules within a certain tissue correlates positively with symptom severity and skeletal muscle anaerobic capacity. Older patients accumulate more deleterious mtDNA which also correlates positively with worse clinical phenotypes. Typical MERRF patients do not show overt symptoms during childhood. The age of onset is thus a strong indicator of disease severity and again adds to the evidence implicating the proportion of mutated to non-mutated mtDNA molecules as a powerful determinant of symptom severity. 2 mutations in the mtDNA of MERRF-positive patients were discovered in this experiment and 1 was in the MTTK gene encoding evolutionarily conserved gene product elements involved in adequate mitochondrial protein synthesis. There was a perfect correlation between the mutation and the disease: all 3 MERRF patients had the MTTK mutation whilst none of the 75 controls did. Reduced numbers of larger mitochondrial translation products were observed in MERRF patients which is expected because the gene products supposed to synthesize them are erroneously encoded due to mutated mtDNA tRNAs. An A (adenine) base is modified in tRNA’s highly conserved TѰC loop responsible for recognizing the ribosome and accommodating the tRNA-ribosome complex for synthesizing proteins. Biopsies from MERRF patients reveal mitochondrial heteroplasmy which is consistent with loss-of-function (LoF) mtDNA mutations of recent origin. The proportion of mutant mtDNA molecules correlates well with symptom severity as well as with skeletal muscle anaerobic threshold. Interestingly, in Shoffner & Wallace’s observations emerged the case of a quasi entirely homoplasmic MERRF patient who started to manifest overt symptoms in her early teens, suggesting that a small amount of normal mtDNA can provide a disproportionately large protective effect on the phenotype for quite some time. This does not contradict the above statements relating the degree of heteroplasmy to the age of onset. Instead, it hints at just how little the proportion of mutated and wild-type mtDNA molecules need be shifted to spur major alterations in phenotype. This adds understanding to speculations regarding the emergence of phenotypic pleiotropy from putative genotypes. Continuing along the lines of improving the resolution of genotype-phenotype linkage, starting out with a molecular marker of disease like the mt-tRNALys point mutation used for diagnosis is very useful. Beyond base assessment, quantifiable measures of what this disease marker is actually doing to a particular patient are crucial for subsequent prioritization of potential treatment avenues, discerning risk-reward ratios and also objectively assessing the situations’ general urgency. Shoffner & Wallace looked at oxidative phosphorylation activity levels in skeletal muscle as one such measure. Oxidative phosphorylation occurs along 4 respiratory chain complexes and a final ATP synthase complex as depicted in Figure 1 of Shoubridge’s 2001 paper “Nuclear genetic defects of oxidative phosphorylation”. These complexes reside in the inner mitochondrial membrane which has a matrix side (bottom) and a cytosolic side (top). Electrons flow along the respiratory chain from NADH- and FADH-linked substrates to molecular oxygen as indicated by the narrow black arrows. Protons are pumped to the cytosolic side of the inner membrane at locations indicated by the thick black arrows. This produces an electrochemical gradient for protons across the inner membrane. The gradient-directed route these protons follow along eventually leads them through the final ATP synthase complex (complex V) where they drive ATP synthesis, providing the universal cellular energy currency. Zeviani & Di Donato highlight how “the fundamental reaction of life, i.e. oxygen activation and the conservation of energy in cell respiration, is essentially a function of the integrity of the inner membrane respiratory chain”(20). Shoffner & Wallace found levels of oxidative phosphorylation obtained by skeletal muscle biopsy correlated best with the patients’ current clinical phenotype. For age-related prognoses, their second measure of mtDNA genotype correlated best. mtDNA genotype refers to the degree of hetero/homoplasmy discussed above. Previous case studies and the recognition that certain tissues have distinct energy demands predicts organ-specific energy thresholds affecting the age of onset in affected individuals. This expectation is confirmed experimentally“(21,22). Many other variables can jumble the order in which symptoms are expected to manifest in tissues: those with the lowest aerobic thresholds succumbing first. “The prominent involvement of the nervous, cardiac and skeletal muscle systems supports the contention that tissues with high aerobic energy demands will be most affected in oxidative phosphorylation disorders, but this simple view cannot explain the selective vulnerability of different organs […]”(23). Part of the ever-growing list of candidate variables contributing to tissue-specific selective vulnerability includes: nuclear genes, environmental influences and especially the somatic replicative segregation of mitochondrial organelles. Our knowledge of these variables is substantially disparate when it comes to understanding how each might affect MERRF. The influence of nuclear genes on the stability of mtDNA is obvious, yet complicated. This can be clarified by characterizing the 4 major ways they can exert their effect on mitochondrial processes. First of all, defects in nuclear genes can affect the stability of mtDNA. Secondly, they can also affect structural components & assembly factors involved in oxidative phosphorylation. Thirdly, even if the defects arise in nuclear genes encoding proteins only indirectly related to oxidative phosphorylation, pathology may arise nonetheless. Lastly, non-protein components encoded by nuclear genes are also important for maintaining a functional respiratory chain. With this in mind, we also know our nuclear genome encodes 1,700 mitochondrial proteins(24) and 69 of the 82 subunits composing complexes I to IV of the mETC. A host of partially characterized assembly and maintenance protein factors for mtDNA exert an influence that still needs figuring out(25). Despite their putative roles, statistical analyses of modern genetic issues suggest that “nucleotide changes in mtDNA that are not intrinsically pathogenic may predispose to, modulate the effects of, or reflect a propensity for the occurrence of deleterious mutations. In turn, deleterious mutations may promote the accumulation of somatic changes, through the generation of OXPHOS-related mutagens”(26). This lends explanatory power to the observation that MERRF phenotypes worsen with age. Nucleotide changes in nuclear or mtDNA are not necessarily the only level at which disease causing events can occur. Yasukawa et al. provided the “first evidence that a post-transcriptional modification deficiency causes a human disease”(27) by studying the wobble modification imparted by the 8344A→G tRNALys mutation. Mitochondrial somatic replicative segregation was discussed above in terms of different tissues having different levels of heteroplasmy. Shoffner & Wallace emphasize the other aspect of heteroplasmic variation by making the point that the “same average mtDNA genotype could result in very different organ-specific genotypes and clinical phenotypes”(28). Their contention is that not only are different tissues segregated with different amounts of mutated mtDNA, but that the same amount of mutated mtDNA exerts differential effects on the phenotype of the tissue depending on that particular tissue’s threshold. Lertrit et al. believe different amounts of mutated mtDNA are distributed amongst different tissues during events originating in utero. They accounted for this by looking at 6 different tissues in a MERRF patient with the 8344A→G mt-tRNALys mutation and observed heteroplasmy in the cerebellum, cerebrum, pancreas, liver, muscle & heart. From this they concluded that “the mutated population of mitochondria must have existed before the formation of the 3 primary embryonic layers”(29). This phenomenon is termed according to the analogy it describes — a ‘mitochondrial bottleneck’ — where “a mother with a low degree of heteroplasmy in her mtDNA can transmit a higher level of heteroplasmy to her children”(30). Environmental influences on MERRF are rife with speculation but are currently hard to formulate in a testable manner. It is worth mentioning, however, that anything with the potential to moderate inevitable effects of aging (such as practicing an evolutionarily concordant lifestyle) is at the very least worth exploring as an adjunct treatment option. Epigenetics is naturally taking on a more prominent role in the scientific study of ‘lifestyle factors’ and mitochondrial disorders. On a basic level, this is simply because it is a fascinating foray into understanding how environmental (external) information comes to sit ‘atop’ (‘epi’) our human databases (genomes) to change us in some way. The field of epigenetics carries a slew of tantalizing ‘known unknowns’ that are best set aside momentarily when disentangling the effects of improper aminoacylation in MERRF patients. MTTK encodes mt-tRNALys which has a UUU anticodon that typically undergoes a post-transcriptional “τm5s2U modification … at the wobble position in the anticodon region”(31) if the ribosome is to decode it properly. The third position is the wobble one, containing a 2-thiouridine derivative, normally ready to be modified. Theory and experiment agree that MERRF 8344A→G mutant mt-tRNALys does not recognize AAA-programmed ribosomes and so the wobble base remains unmodified. 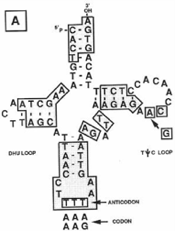 A 1989 in vitro cybrid clone(32) experiment shows the consequence of this lack of anti-codon recognition by measuring the difference in respiration rate between MERRF 8344A→G mutant cybrid clone cells (ME1-4) and their wild-type control counterparts (Ft2-11). The respective respiration rates of ME1-4 and Ft2-11 was 1.7 and 5.3 fmol/min/cell(33). That same experiment also found the overall protein synthesis rate substantially decreased in the mutant cybrid clones. Could faulty aminoacylation be to blame? To answer this, the group then looked to compare charged (aminoacylated) or uncharged (non-aminoacylated) mt-tRNAs and found very similar aminoacylation levels between both mutant and wild-type control cells. Defective aminoacylation is not the problematic mechanism underlying MERRF. Kolesnikova et al. test this further. They find that yeast-derived “imported tRNALys [into human fibroblasts] is correctly amino-acylated and able to participate in mitochondrial translation, partially rescuing mitochondrial function”(34). This view is strengthened by the fact that mt-tRNALys does not lose significant affinity for bovine-derived EF-TU elongation factor compared to wild-type cells, thus retaining its aminoacylation efficiency. Crystallographic analysis of the anticodon stem-loop belonging to mt-tRNALys shows it is important for recognizing the ribosome. It also strengthens the currently accepted molecular mechanism whereby decreased mETC respiration in MERRF stems from defective taurine modification in the wobble position of the anti-codon that results in the inhibition of proper base pairing at the mt-tRNALys-ribosome junction. In vitro experimentation from the same group provides 2 plausible accounts for the observed increases in intracellular lysine. The ribosomes can stall facing an empty A-site and terminate translation prematurely. Alternatively, frameshifting at lysine codons may produce abortive proteins to be shuttled away from the mETC for degradation by ATP-dependent mitochondrial proteases. On principle at least, both explanations are not mutually exclusive and may conceivably occur together; sometimes the amino acid will not form because translation was prematurely terminated and other times the amino acid will form only to be subsequently degraded. Oxidative phosphorylation is identified as the defective process in MERRF and the molecular interactions between ribosomes and tRNAs translating amino acids involved in the process have been described above. 2 logical questions might follow, such as; ‘which of the 5 complexes along the mETC cease to function normally as to impact respiration in this disorder?’; and ‘do nuclear genes contribute to mtDNA instability in MERRF (if so, how)? Of the 13 mitochondrially encoded polypeptides involved in oxidative phosphorylation, complexes I and IV have the most, with 7 and 3 subunits, respectively. Despite their numbers, in MERRF complex IV is in fact the most prominently affected whilst complex I only occasionally(35). Complex V just has 2 and complex III only 1 and they are not significantly affected. Defects in more than 1 respiratory complex are common in disorders with mtDNA mutations. As in MERRF, tRNA deletions or mutations predominate and tend to give rise to translation defects. MERRF is somewhat of an exception amongst mitochondrial disorders in that its 4 canonical features correlate very tightly to its predominant, heteroplasmic tRNALys 8344A→G point mutation. Until now, only LHON patients with ND gene mutations and those with exercise intolerances linked to the cytochrome b gene reflect this level of correlation(36). In contrast to MERRF’s most affected complexes, complex II does not contain any subunits from mtDNA. However, its possible role as a cellular oxygen sensor has many interesting potential implications for the other 4 complexes in MERRF and other mitochondrial disorders(37). 3 genes encode subunits SDHB, SDHD & VHL in complex II that function as putative tumor suppressors by responding to hypoxic conditions via still unknown molecular mechanisms. It is curious that SDHA mutations can produce Leigh syndrome (LS) but mutations in the other 3 subunits do not. Instead, they are associated with cancer and not with nervous system disorders like LS which is puzzling. The mitochondrial disorder MNGIE (mitochondrial neuro-gastro-intestinal encephalomyopathy) is another example of non-mtDNA mutations affecting mitochondrial functions. It involves a defective nuclear gene encoding the TP enzyme (thymidine phosphorylase) impacting mtDNA replication rate and fidelity because of imbalanced dNTP pools containing excess dTTP(38). Thus, certain mitochondrial disorders are clearly affected by nuclear gene-encoded components and MERRF appears vulnerable to their exacerbations — at least in principle. 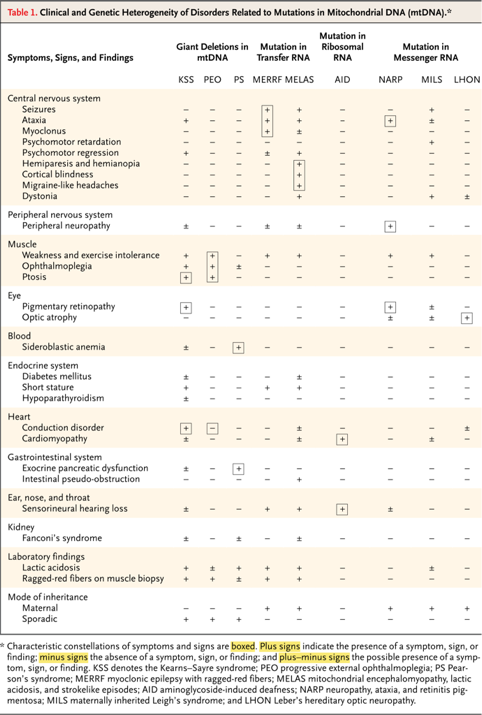 Table 1 Clinical and Genetic Heterogeneity of Disorders Related to Mutations in Mitochondrial DNA below, serves as a map of sorts highlighting where our predictions about which complexes will be affected in which disorders fall short. This is reflected in the fact that 50% of adult and 80-90% of paediatric patients suffering from a mitochondrial disorder remain unlinked to a defective gene. 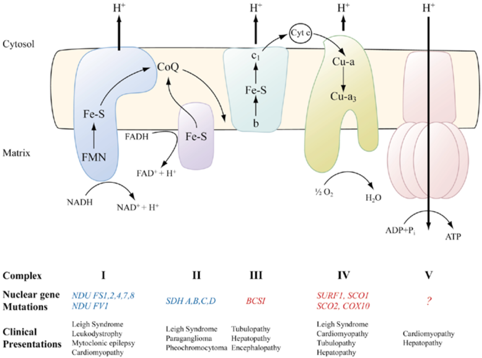 Why do abnormal mitochondria accumulate beneath the sarcolemmal membrane as to produce RRFs typical of the majority of mitochondrial disorders but not in Leigh syndrome? Thankfully the search field for factors capable of filling-in those explanatory gaps can be narrowed down by learning from those failed predictions and consequently also shed some light on how phenotypes emerge from genotypes. A more immediately answerable question is “whether discrete syndromes based on clinical features can be reliably identified or whether these disorders represent a continuum among the mitochondrial myopathies”?(39). Byrne et al. asked this in 1988 and since then, the evidence that has surfaced leans heavily towards a continuum. Nevertheless, because these diseases “include both Mendelian-inherited and cytoplasmic-inherited diseases”(40), some take this as a challenge to the idea of a continuum. However, this position is rapidly becoming less and less tenable with knowledge of epigenetic methylation and histone modification mechanisms. We also know 1 gene can often originate multiple gene products — and isoforms — because it is actually providing a template suitable for a vast repertoire of possible gene-products ready to be moulded by post-transcriptional and post-translation modifications. Lastly, in 1996 Poyton & McEwan successfully demonstrate the existence of a “bidirectional flow of information between the nuclear genome and the mitochondrial genome to adjust energy production in tissues to different energetic demands”(41), solidifying the idea of oxidative phosphorylation disorders sitting on a continuum. In light of this, it is important to note that diseases inherited in a Mendelian manner appear quite more vulnerable to therapeutic interventions if this ‘information stream’ can be successfully manipulated. The idea of bidirectional genomic information flow underlies much of the discussion to follow where MERRF is compared and contrasted to other oxidative phosphorylation disorders. Consider MELAS (mitochondrial encephalomyopathy, lactic-acidosis & stroke-like episodes), a maternally inherited disease caused by a 3243A→G point mutation in the MTTL1 gene encoding tRNALeu. The point mutation is very similar to that in MERRF and there is significant symptom overlap (see Table 1 above). However, the proclivity of brain tissue to harbour different mutation concentrations is perplexing: in MERRF the small cerebral vessels contain high concentrations and in MELAS it is the dentate nucleus of the cerebellum(42). Complexes I and IV are also affected in MELAS but the situation is reversed: complex I is most affected and complex IV typically remains intact. Both MELAS and MERRF display COX-depleted RRFs via histochemical staining, although in the former it is not a canonical feature, unlike in MERRF. This fact harkens back to the exceptional phenotype-genotype correlation observed in MERRF that is unequaled in MELAS — even as regards COX-deficient tissues. To explore both disorders further, a timely case study was published this year by Liu et al. who described a 19 year old Chinese girl with overlapping MERRF and MELAS syndromes with a confirmed T3291C point mutation in the MTTL1 gene encoding tRNALeu(UUR). Biopsies from her left bicep revealed a mixed findings that may be somewhat expected with symptom overlap: there were about 10% of scattered RRFs, scattered COX-deficient fibers with 35% of them containing RRFs and scattered succinate dehydrogenase-reactive vessels (SSVs), 85% of which retained COX activity. Respiration assessments on fibroblasts revealed a heavy reliance on glycolysis instead of oxygen consumption, confirming defective oxidative phosphorylation. Western blot analysis of viable mitochondrial complexes in her fibroblasts revealed substantial decreases compared to controls: 24.9% for complex I and 14.8% for complex IV. The latter complex is typically nearly untouched in MELAS. In MERRF it is complex I that usually does not show as much dysfunction. The absence of dysfunction in complexes II, III and V is another clue as to the susceptibility of individual complexes to mutations in genes encoding faulty translation components. The authors offer an interesting observation regarding how heteroplasmic tissue segregates. They report that her muscle tissue retained a higher concentration of mutations compared to her lymphocytes and fibroblasts, convincing the authors that “negative selection for defective mitochondria is possible for rapid turnover cells, such as lymphocytes and fibroblasts, but difficult for highly differentiated, postmitotic syncytial muscle cells”(43). The authors hold progressive views regarding the pleiotropic nature of mitochondrial mutations, as they clearly state that there is a “clinical spectrum associated with the m.3291T>C mutation”(44). NARP (neuropathy, ataxia, and retinitis pigmentosa) patients also evolve along a spectrum, all the way to (maternally inherited) Leigh syndrome when surpassing a 95% threshold of heteroplasmy. Strangely, NARP patients maternally inherit a T—>G8993 or T—>C8993 point mutation in the complex V ATPase 6 subunit gene, despite Leigh syndrome associated mutations being present in complexes I to IV but not V! Furthemore, RRF-positive muscle biopsies are nearly unheard of in NARP patients. Why would they not have abnormal mitochondria accumulate beneath the sarcolemmal membrane like in other respiratory chain disorders? This mystery persists. There are no mainstream cures for mitochondrial disorders, only treatments for the symptoms. Drugs are prescribed to affected patients but this unfortunately and mostly exchanges one symptom for another, or at best, abates symptoms without causing too much collateral damage. Much of this limitation stems from the 1-disease-1-drug paradigm under which conventional but not cutting-edge(45) medicine still functions. It simply does not fit with current knowledge of disease pleiotropy and plasticity. A fundamentally misplaced focus on treating symptoms rather than investigating root causes coupled to a failure to distinguish between these is largely to blame. After all, antibiotics treat infections, immune suppressants treat autoimmune flares, serotonin re-uptake inhibitors treat depression and anti-epileptics drugs (AEDs) treat epilepsy and so on and so forth. That being said, it must be recognized that treating disorders at their root is decidedly easier said than done and in the interim, symptoms must be somehow managed. The Hippocratic oath to ‘first do no harm’ is commonly jeopardized to that end. Unfortunately, the standard of care for MERRF patients conforms succumbs to that trend. MERRF patients are prescribed AEDs for seizure control and myoclonus(46) as well as standard pharmaceuticals for managing cardiac symptoms(47). Some L-carnitine and Coenzyme Q10 (CoQ10) is given; they help transport fatty acid derived components into mitochondria for aerobic respiration and aid the mETC to transfer electrons along the respiratory chain, respectively. Although CoQ10 is ineffective at significantly improving symptoms in MERRF patients it could still benefit those individuals also suffering with a primary CoQ10 deficiency. This benefit is apparent with its shorter chain analogue Idebenone that proves “effective in halting or even improving the hypertrophic cardiomyopathy in Friedreich’s ataxia”(48). CoQ10 is also known to be helpful with myopathies resulting from statin side-effects. It was initially supposed to go hand-in-hand with statin prescriptions, lending further support for trying it as an adjunct to AEDs. Standard physical therapy and aerobic exercise are encouraged as adjuncts to the aforementioned MERRF treatments along with minor surgery for ptosis correction (droopy eyelid). Creatine has been extensively studied; it is quite safe, cheap and supplementing with it is helpful in some mitochondrial disorders but not others. Lactic acidosis is very toxic to cells and is poorly managed, even with “the use of lactate-lowering agents including riboflavin, succinate and coefficient Q”(49). This technique discusses the manipulation of prenatal events with the view of offering a cure or treatment. This begs the question: What about a prenatal MERRF diagnosis? Unfortunately, a prenatal diagnosis is not possible due to the tissue-partitioning of mitochondria that occurs in utero. Looking forward, gene therapy does not yet offer practical implementations of the exciting theories and principles developing under its purview. Stopping mutant mtDNA from being replicated is one theoretical approach on offer. It involves recognizing these mutant mtDNA sequences with sequence-specific antigenomic peptide-nucleic acids which should subsequently inhibit the replication of their target sequence. Although MERRF is a maternally inherited disease, there may be substantial methodological overlap with potential treatments for autosomal recessive oxidative phosphorylation disorders. For example, microcell-mediated chromosome transfer(53) could potentially help with extra-organellar components influencing MERRF’s severity even if the causal mutation is not resolved. Furthermore, direct cloning by complementation with retroviral cDNA expression libraries(54) is a tantalizing prospect with a meaningful track-record in vitro and in vivo. However, it needs to affect multiple tissues with particular heteroplasmic thresholds and precisely titrate expression in a timely manner. There appear to be many obstacles for every promising solution awaiting discovery. The elimination of dysfunctional mitochondria by modulating mitophagy, apoptosis and other cellular quality control dynamics has been proposed. This approach is endorsed by DiMauro et Schon who argue that the “possibility of mitochondrial dysfunction needs to be taken into account by every medical subspecialty […] progress in this field has been striking enough to amply justify the term ‘mitochondrial medicine’”(55). Current pharmaceutical drugs targeting mitochondria are still imprecise, weak and replete with side-effects that are often times worse than the disorder itself. Fortunately, a lot of the scientific literature from disparate fields has uncovered epigenetic influences — also known as lifestyle factors — affecting numerous quality control mechanisms of the organelle, inside and outside of it. Despite these encouraging avenues, mainstream research remains committed to distilling these hypercomplex effects into drug form before exploring non-drug approaches. Thankfully, there are roads to explore in the mean time. Examples include — but are not limited to — lifestyle factors guided by an evolutionarily concordant framework revolving around: nutrition, circadian rhythms entrainment, appropriate movement and activity and electrical stimulation of muscles and the brain(56,67). These attempts are both old and novel in many respects. They are often times significantly more reliable, reproducible, impactful and safe compared to conventional pharmaceutical drug treatments. Labelling such approaches as ‘holistic’ seems appropriate as the influences on mitochondria arise from many yet undiscovered pathways and feedback systems. What is being affected is not a single organ system, but organelles that allow the fundamentally life-sustaining process of respiration, carried out in nearly every cell in our body. Mitochondrial medicine is poised to modernize the medical paradigm. Wallace, Zheng, Lott, Shoffner, Hodge, Kelley, Epstein, Hopkins, DW, XZ, ML, JS, JH, RK, CE, LH , 1988. Familial Mitochondrial Encephalomyopathy (MERRF): Genetic, Pathophysiological, and Biochemical Characterization of a Mitochondrial DNA Disease. Cell, [Online]. 47 (1), 601-610. Available at: http://ac.els-cdn.com/0092867488902188/1-s2.0-0092867488902188-main.pdf?_tid=d928d3aa-2e02-11e4-96a5-00000aab0f27&acdnat=1409155229_fc5a4a4058c4be9158b597bc7b3033bd [Accessed 27 August 2014]. Nature. 2001. Initial sequencing and analysis of the human genome. [ONLINE] Available at: http://ghr.nlm.nih.gov/mitochondrial-dna. [Accessed 27 August 14]. Schoffner, Lott, Lezza, Seibel, Ballinger, Wallace, JS, ML, AL, PS, SB, DW, 1990. Myoclonic epilepsy and ragged-red fiber disease (MERRF) is associated with a mitochondrial DNA tRNA(Lys) mutation. Cell, [Online]. 61 (6), 931-7. Available at: http://www.sciencedirect.com/science/article/pii/009286749090059N [Accessed 05 August 2014]. Yasukawa, Suzuki, Ishii, Ohta & Watanabe, YT, ST, IN, OS & WK, 2001. Wobble modification defect in tRNA disturbs codon-anticodon interaction in a mitochondrial disease. The EMBO journal, [Online]. 20 (17), 4794-4802. Available at: http://www.pubmedcentral.nih.gov/articlerender.fcgi?artid=125593&tool=pmcentrez&rendertype=abstract [Accessed 15 August 2014]. Zeviani, Di Donato, ZM, SD, 2004. Mitochondrial disorders. Brain: a journal of neurology, [Online]. 127 (10), 2153-2172. Available at: http://www.ncbi.nlm.nih.gov/pubmed/15358637 [Accessed 15 August 2014]. Schoffner, Lott, Lezza, Seibel, Ballinger, Wallace, JS, ML, AL, PS, SB, DW, 1990. Myoclonic epilepsy and ragged-red fiber disease (MERRF) is associated with a mitochondrial DNA tRNA(Lys) mutation. Cell, [Online]. 61 (6), 931-937. Available at: http://www.sciencedirect.com/science/article/pii/009286749090059N [Accessed 05 August 2014]. OMIM. 2013. TRANSFER RNA, MITOCHONDRIAL, LYSINE; MTTK. [ONLINE] Available at: http://www.omim.org/entry/590060. [Accessed 27 August 14]. NCBI. 2003. MERRF. [ONLINE] Available at: http://www.ncbi.nlm.nih.gov/books/NBK1520/. [Accessed 27 August 14]. Mancuso, Filosto, Mootha, Rocchi, Pistolesi, Murri, DiMauro, Siciliano, MM, FM, MV, RA, PS, ML, DS, SG, 2004. A novel mitochondrial tRNAPhe mutation causes MERRF syndrome. Neurology, [Online]. 8(62), 2119-2121. Available at: http://www.neurology.org/cgi/pmidlookup?view=long&pmid=15184630 [Accessed 14 August 2014]. Strachan & Read, TS, AR, 2011. Human Molecular Genetics. 4th ed. Italy: Garland Science. DiMauro, Schon, DS, SE, 2003. 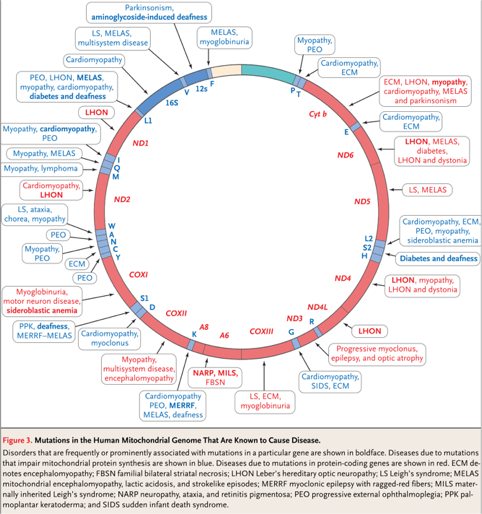 Mitochondrial respiratory-chain diseases. The New England journal of medicine, [Online]. 348 (26), 2656-2668. Available at: http://www.ncbi.nlm.nih.gov/pubmed/12826641 [Accessed 19 August 2014]. OMIM. 2014. CYSTIC FIBROSIS TRANSMEMBRANE CONDUCTANCE REGULATOR; CFTR. [ONLINE] Available at: http://omim.org/entry/602421. [Accessed 27 August 14]. Jenuth JP1, Peterson, Shoubridge, JJ, PA, SE, 1997. Tissue-specific selection for different mtDNA genotypes in heteroplasmic mice. Nature Genetics, [Online]. 16 (1), 93-95. Available at: http://www.ncbi.nlm.nih.gov/pubmed/?term=9806551 [Accessed 15 August 2014]. Shoubridge, ES, 2001. Nuclear genetic defects of oxidative phosphorylation. Nature Genetics, [Online]. 10 (20), 2277-2284. Available at: http://www.ncbi.nlm.nih.gov/pubmed/11673411 [Accessed 15 August 2014]. Abbott, Francklyn, Robey-Bond, AJ, FC, RS, 2014. Transfer RNA and human disease. Frontier Genetics, [Online]. 5 (June), 158. Available at: http://www.ncbi.nlm.nih.gov/pubmed/24917879 [Accessed 17 August 2014]. Wilkins, Carl, Swerdlow, HW, SC, RS, 2014. Cytoplasmic hybrid (cybrid) cell lines as a practical model for mitochondriopathies. Redox Biology, [Online]. 2, 619–631. Available at: http://ac.els-cdn.com/S2213231714000536/1-s2.0-S2213231714000536-main.pdf?_tid=57fc79a4-3522-11e4-93ff-00000aab0f26&acdnat=1409938414_b85bdc5b3f18cf18942672e43cb8e492 [Accessed 05 September 2014]. Taylor, Turnbull, RT, DT, 2005. Mitochondrial DNA mutations in human disease. Nature reviews. Genetics, [Online]. 6 (5), 389-402. Available at: http://www.pubmedcentral.nih.gov/articlerender.fcgi?artid=1762815&tool=pmcentrez&rendertype=abstract [Accessed 20 August 2014]. Byrne, Trounce, Dennett, Gilligan, Morley, Marzuki, BE, TI, DX, GB, MB, MS, 1988. Progression from MERRF to MELAS phenotype in a patient with combined respiratory complex I & IV deficiencies. Journal of the neurological sciences, [Online]. 88, 327-337. Available at: http://ac.els-cdn.com/0022510X88902298/1-s2.0-0022510X88902298-main.pdf?_tid=b6e4f1f4-290a-11e4-b27c-00000aab0f26&acdnat=1408608852_ea351f419fdf78e713fd2f43857402f2 [Accessed 22 August 2014]. Poyton, McEwan, RP, JM, 1996. Crosstalk between nuclear and mitochondrial genomes. Annual Reviews, [Online]. 65, 563-607. Available at: http://www.annualreviews.org/doi/pdf/10.1146/annurev.bi.65.070196.003023 [Accessed 22 August 2014]. Kaiming, Hui, Kunqian, Chuanzhu, LK, ZH, JK, YC, 2014. MERRF/MELAS overlap syndrome due to the m.3291T>C mutation. Metabolic brain disease, [Online]. 29 (1), 139-144. Available at: http://www.ncbi.nlm.nih.gov/pubmed/24338029 [Accessed 23 August 2014]. Morphy, Kay, Rankovic, RM, CK, ZR, 2004. From magic bullets to designed multiple ligands. Drug Discovery Today. [Online]. 9, 641-651. Available at: http://ac.els-cdn.com/S1359644604031630/1-s2.0-S1359644604031630-main.pdf?_tid=e7697a04-2b60-11e4-8235-00000aab0f6c&acdnat=1408865772_bbd2beb8638d841b0d7d8e23e24017dd [Accessed 24 August 2014]. Epileptic Society. 2014. List of anti-epileptic drugs. [ONLINE] Available at: http://www.epilepsysociety.org.uk/list-anti-epileptic-drugs#.U_mao7ySzKk. [Accessed 24 August 14]. American Heart Association. 2014. Cardiac Medications. [ONLINE] Available at: http://www.heart.org/HEARTORG/Conditions/HeartAttack/PreventionTreatmentofHeartAttack/Cardiac-Medications_UCM_303937_Article.jsp. [Accessed 24 August 14]. Xiao, Li, Zhang, Wang, FX, JL, XZ, XW, 2013. Antiepileptic treatment and blood lactate level alteration in patients with myoclonic epilepsy with ragged-red fibers (MERRF) syndrome in a Chinese family. Neurology Asia, [Online]. 18 (1), 47-51. Available at: http://www.neurology-asia.org/articles/neuroasia-2013-18(1)-047.pdf [Accessed 24 August 2014]. Small, Marechal-Drouard, Masson, Pelletier, Cosset, Weil, Dietrich, SI, ML, MJ, JP, CA, WJ, DA, 1992. In vivo import of a normal or mutagenized heterologous transfer RNA into the mitochondria of transgenic plants: towards novel ways of influencing mitochondrial gene expression?. EMBO, [Online]. 11, 1291–1296. Available at: http://www.ncbi.nlm.nih.gov/pmc/articles/PMC556576/ [Accessed 24 August 2014]. Chomyn, Meola, Bresolin, Lai, Scarlato, Attardi, CA, MG, BN, LS, SG, AG, 1991. In vitro genetic transfer of protein synthesis and respiration defects to mitochondrial DNA-less cells with myopathy-patient mitochondria. Molecular Cellular Biology, [Online]. 11, 2236–2244. Available at: http://mcb.asm.org/content/11/4/2236 [Accessed 24 August 2014]. Bio.Davidson.edu. 2000. Expression Libraries. [ONLINE] Available at: http://www.bio.davidson.edu/courses/Molbio/expression/expression.html. [Accessed 24 August 14]. Bisht, Darling, Grossmann, Shivapour, Lutgendorf, Snetselaar, Hall, Zimmerman, Wahls, BB, DW, GR, SE, LS, SL, HM, ZM, WT, 2014. A multimodal intervention for patients with secondary progressive multiple sclerosis: feasibility and effect on fatigue. Journal of Alternative and Complementary Medicine, [Online]. 20 (5), 347-355. Available at: http://www.ncbi.nlm.nih.gov/pubmed/24476345 [Accessed 24 August 2014]. Wahls, Rubenstein, Hall, Snetselaar, TW, RL, HM, SL, 2013. Assessment of dietary adequacy for important brain micronutrients in patients presenting to a traumatic brain injury clinic for evaluation.. Nutritional Neuroscience, [Online]. 0, 0. Available at: http://www.maneyonline.com/doi/abs/10.1179/1476830513Y.0000000088?url_ver=Z39.88-2003&rfr_id=ori:rid:crossref.org&rfr_dat=cr_pub%3dpubmed&amp; [Accessed 24 August 2014].